Despite the damage to its reputation, Shell insists on continuing its controversial Arctic campaign. The company says that the world needs the oil and gas resources of the Arctic. But according to Energy Post’s editor-in-chief Karel Beckman, it’s really Shell itself that needs those resources. Shell’s annual shareholders meeting last Tuesday (19 May) in The Hague seemed almost like a climate conference, some observers reported. Activist shareholders lined up to ask Shell to embrace the energy transition, or at least, as one of them put it, to “invest profits from oil and gas in new energy instead of more fossil energy”. Most of all, they urged Shell to desist from drilling in the Arctic Ocean off Alaska, which Shell got permission to do from the US government just a week earlier (on 11 May). And the activists were not in a minority this time. At the meeting, 98.9% of the shareholders supported a resolution for the company to report henceforth on the climate risks of its business, which Shell has agreed to do starting next year. Some institutional investors also weighed in. Dutch pension management fund APG, which manages investments for the largest Dutch pension fund ABP and controls some $1 billion in Shell stock, explicitly asked Shell to halt its activities in the Arctic. According to portfolio manager Jags Walia, Shell’s activities in the Arctic present not only unacceptable environmental risks, but also risks to the value of the company. Walia referred to the fate of BP after the Deepwater Horizon disaster. If a disaster like that were to happen in the Arctic, said Walia in radio and newspaper interviews, after all the warnings, the reputational damage to Shell would be “huge”. Walia made the point that the risk Shell is taking in the Arctic far outweighs the possible reward. The company, he said, can only expect to start making profits around the middle of the next decade at the earliest, and then only if the oil price is at least $80 per barrel. Much better, said Walia, would be for Shell to invest in other projects, for instance in Brazil and Australia and in its new acquisition, BG. But Shell remained deaf to all these pleas. CEO Ben van Beurden said Shell was managing the risks of Arctic drilling “down to the levels that we think are acceptable and indeed negligible”, according to the Wall Street Journal. He has no intention to leave the Arctic. So why does Shell find it necessary to press on in the Arctic region, despite the risks and reputational damage it’s already suffering? Why doesn’t the company simply to decide to put its money elsewhere? Shell’s Sustainability Report 2012 contains an interview with Marvin Odum, Upstream Americas Director, who is asked this very same question:“Why does Shell want to explore off the coast of Alaska?”. Pickard makes a similar point in the 2013 Sustainability Report, where she notes that “Alaska oil and gas represents a potentially enormous and vital energy resource for the world”. In other words, Shell justifies its Arctic campaign with reference to the world’s growing energy needs. How credible is this? According to the famous US Geological Survey (USGS) report of 2008 (see also this press release), the Arctic contains an estimated 90 billion barrels of “technically recoverable” oil and 1670 tcf (trillion cubic feet) of technically recoverable natural gas. According to the USGS, this is “13 per cent of the undiscovered oil and 30 per cent of the undiscovered natural gas” in the world (though I have to confess I don’t understand how anyone can claim to know how much “undiscovered” oil and gas there is in the world). Note that USGS refers to “technically recoverable” oil and gas, which is not the same as economically recoverable. How much oil can be economically recovered depends on many factors, not the least of which is the oil price. If we take a very high recovery rate, say 33%, and we just look at oil, it means that 30 billion barrels of oil could be produced from the Arctic region. This applies to the resources of the entire Arctic region. If we just look at the Alaskan part, this is estimated to contain 27 billion barrels of technically recoverable oil. Slightly more than half of this, some 15 billion barrels, are in the Chukchi Sea, where Shell is going to be active. According to this report from the US Bureau of Ocean Energy Management, at an oil price of $60 per barrel, about a third of these 15 billion barrels could be produced, i.e. 5 billion barrels. Thus, if Shell makes a success of its Arctic campaign, the Chukshi Sea can supply the world’s oil needs for just two months. In other words, to say, as Ann Pickard does, that “exploration of the Arctic is important as future generations may have to depend on it for a significant amount of their energy”, seems off the mark. The world can do without Arctic oil and gas – indeed, it will have to, because Arctic oil and gas will never be able to supply more than a fraction – or a very short period – of the world’s energy needs. What is key here is the “prospect size” of these four types of resources. 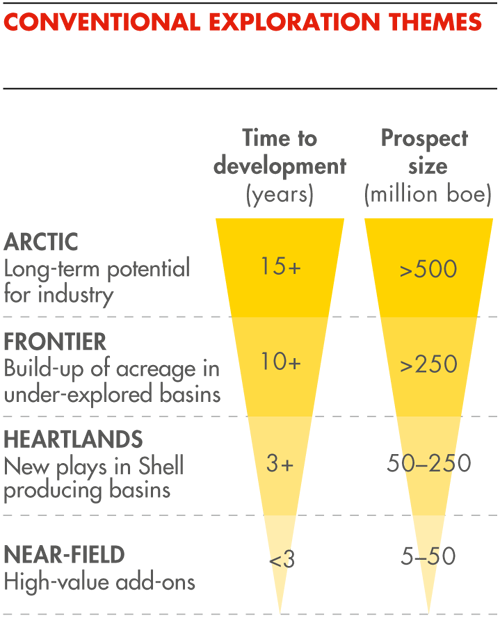 As can be seen from the graph, the Arctic resources represent by far the greatest prospect size, twice as much as the frontier positions, four times as much as the heartlands, and twenty times as much as the near-field resources. For a company like Shell, as long as it does not radically change its business model, it is essential to maintain its proved oil and gas reserves. That is what most of the value of the company is based on. In 2014 Shell produced 3.1 million barrels of “oil equivalents” (oil and gas together) per day (2% of global oil production and 3% of gas production), i.e. 1.13 billion barrels per year. The company’s total proved oil and gas reserves at the end of 2014 stood at 13 billion barrels, i.e. good for just 11.5 years of production. This means Shell constantly has to find (or buy) new oil and gas, if it is to stay in business as an oil and gas company. Roughly over 1 billion barrels per year. The question for Shell is where to find these new resources. It doesn’t have a whole lot of options. Most major oil and gas producing countries, like Brazil, Russia, Saudi Arabia and the like, prefer to retain ownership of their own resources. What is left are politically risky areas such as in Africa or Iraq, or highly competitive regions like the Gulf of Mexico. And then there is of course Alaska: an oil state that is 90% dependent on fossil fuel revenues and lets private companies own resources. Some have questioned the profitability of oil production in the Arctic. Shell has already spent some $7 billion on preparatory activities (including $2 billion to purchase the licenses in the Chukchi Sea). It will have to spend many billions more before even molecule of oil or gas is produced. But last year Shell invested $37 billion; it does that roughly every year. So the investment is not prohibitive. And Shell may know more about the Chukchi sea than we do: the company already drilled wells offshore in Alaska in the 1980s and 1990s. These efforts were abandoned when oil prices collapsed to $20 a barrel. In addition, although climatic conditions may be daunting in the region, the Alaskan waters where Shell wants to drill are very shallow, just some 150 feet, compared to the 5,000 foot depths in the Gulf of Mexico. This makes operations there much simpler and therefore cheaper. What is interesting is that this implies that Shell’s decisions in the Arctic will demonstrate, like no other activity, the business model the company is committed to. If Shell were to decide to leave the Arctic, that would be a significant step indeed. Leaving aside Pickard’s somewhat dubious assumption that “the people” are identical with their governments, she does have a point. If these nations decide they need or want to get their hands on the oil and gas in the Arctic, they will do so – and then it hardly matters who does the drilling. It might as well be a relatively responsible and competent company like Shell. In that sense, the activists and shareholders who are demanding that Shell leaves the Arctic, are aiming at the wrong target. They should be targeting the governments of the Arctic countries first of all. If Shell really believes this, isn’t it time that the company should at least start to alter its course? Nothing in the company’s utterances indicates that it is doing so, as critics like John Ashton and Adriaan Kamp have recently pointed out on Energy Post. 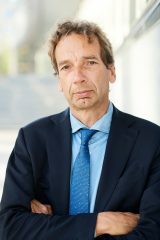 Van Beurden clearly does not believe that 25 years from now supply and demand of energy will look fundamentally different from today. Good story, thanks. One comment: “technically recoverable oil” already includes the recovery efficiency. Hi Jacques, good to see you in this forum as well (after we tried to convince investors yesterday at Actiam’s round table discussion). We have to keep explaining why drilling in the Arctic is pointless, environmentally and financially. An integrated energy company would make more sense as a large company unless you want to get wiped out as a company – the lessons of history been forgotten or do Multinational fail to realise to realise that wind /solar/ geothermal etc… will get better exponentially – solar is now over 30% efficient so have yer corporate heads up yer corporate behinds? This is the 21st century – are you all dead from the neck up? Nuanced and realistic analysis. The last sentence summarises Shell’s position: business as usual for the next 25 years. Shell underestimates two things: the fast and disruptive progress of renewable energy, and the leading role Shell’s brains and billions could play in the energy transition. Shell should take the profits from fossil energy (enjoy it as long as you have it) and invest these profits in renewable technology to stay a leading energy company. Mark you hit it on the head ! Do we really want a polluted cesspit of a planet for our kids and their kids ? what’s wrong with being an “Energy Company” rather than an Oil n Gas Co? Lack of balls or brains? When is any1 gonna wake up and smell the coffee? Energy market is bigger than just good ol’ Oil N Gas aint it ! Any takers ? After all we are in The 21st Century? Hi Paul, thank you for your endorsements. You can support our case by becoming a green share holder in Shell in one click (31 euro) at http://www.follow-this.org. After you become shareholder, don’t forget to send Shell CEO Ben van Beurden an e-mail as shareholder (also one click). We believe Shell can change the world (and survive) by putting it’s brains and billions behind renewables. AAhhh, renewables for our children! In my opinion, the “renewables” just ruin their future. Solar and wind are never able to supply the energy for a modern country, it is midget technology, completely unreliable and storage at mass scale is unaffordable. The worst of all is the lack of energy. Combustion engines make noise and stink, but without we die. Better a stinking coal fired power station, than no energy. To be realistic: at present we do not have the technology for nation wide decarbonization. Most likely, the fossil fuel era will last some more centuries when methane hydrates are harvested from deep sea. Windfarms will be scrapyards within 20 years, sad symbols of mass delusion. The entire story (why Shell + Arctic) is undermined with this assumption: “The world’s population is increasing, living standards are rising and economies need energy to grow”….. yes. “Yet in many regions, easy-to-access energy resources are scarce”…. I have not noticed a scarcity of sun in sub-saharan Africa (or Pakistan) for example. Or indeed a shortage of wind in western europe. “To meet growing demand we need a mix of strategies, and we must develop all forms of energy, traditional and renewable” Oil is not “traditional” it has been around for 100 years – before that it was coal & wood (with some gas). RES needs to exand, fossils need to contract – it is the latter that Shell (& Russia) does not like or agree with. For the next century the world will be powered by oil and gas. There is no choice. In spite of all rhetorics, an energy transition has not even started yet. Energy transition = storage transition. Coal, oil , gas, uranium , thorium is stored energy, sun and wind are not. So Shell ‘s business is quite logical, the oil companies are our lifeline. In time we will say “thank you” to Shell, not the least for their courage to withstand naieve ideologists . “For the next century the world will be powered by oil and gas.” Right now only a proportion of the world is powered by oil and gas. This proportion will decrease significantly in the next decades. This has nothing to do with ideology but with the inherent advantages of alternative technologies like the electric car. It is simply way more efficient and cheaper to use and therefore electrification will take over the transportation sector and this is really just because it has physics on its side. Shell should put its money in future technology instead of wasting everyones time and money. Why on earth should anyone thank Shell for that? It’s like investing in a steam engine train in the 1930’s. The transportation segments are likely to move towards a higher level of electrification in the future; yes that is correct. But that level will NEVER reach 100% If it makes it to 75% electrified worldwide that would be great. Oil/gas is used for feedstock for many of our everyday items… including medicines (Ibuprofen). At some point in time we might be able to economically synthesize the feedstocks using captured CO2, H2, etc.. however currently it takes more energy to synthesize than using the natural raw materials. Shell has over inflated its view of how valuable they are… but you need to be careful not to over promote a world with ZERO oil/gas… because that’s still perhaps 100+ years away. There is a couple of other observations missing about the drilling. The US does not allow export of direct export of oil from the US operations to other parts of the world. Finished products yes, but not crude. So that statements about the oil needed for the world – really imply that the Arctic oil would be used domestically – freeing other parts of the worlds oil reserves up for those in Europe and Asia. I’m sure that Shell is seeing how aggressive China’s oil companies have gotten about bidding on and trying to develop some of the worlds other oil fields. Shell’s probably worried long term that without access to Arctic oil they will have refineries in the US that are idled. Idled is a key world. The best way to slow down the drilling in the Arctic is to dramatically reduce the consumption of oil in the Americas (US, Canada, Mexico, Caribbean, Central America and South America), the whole of Europe, and Asia (China primarily). If demand drops – those refineries would be idled anyway and the need to keep drilling for the ready reserves to feed the consumption is no longer necessary. Oil is still used for heating, shipping (large bulk cargo ships), transportation, generation, our cars, plastics, you name it..
Reducing consumption does have impacts – we’ve seen this during the 2006-2007 run up to the global economy collapse when fuel prices climbed out of sight. When the economies collapsed and the shipping, trucking, car transportation slowed significantly… oil prices collapsed and drilling eventually slowed. Shell’s responding to market conditions as they see them – if we change their market – they will respond to the new market conditions. Usually we see this in the other direction: major oil companies are putting a lot of energy into maintaining their market conditions, i.e. climate change denial, reserve and demand forecast, etc. Turning this the other way around is a very nice idea, thanks Dennis. The climate changes all the time, let’s be glad there is no cooling. The climate change hysteria does a lot of harm: it frustrates research for a real energy transition which will once be needed. In the meantime the earth and nature are doing very well. The planet is greener then ever thanks to some more CO2, the basic building block of life. Major droughts are now occurring on all the continents. The extra CO2 in the air doesn’t help plants that haven’t seen rain for months. Nor does it help with the recovery of prairies or forests that have been burned by fires. I’m in the NW part of the US. We also have drought conditions… not just California. I agree, water is a basic need for life. Progress is less dependency on land or climate. For drought desalination plants and hydrocultures. In all cases a lot of energy is needed. Lack of energy reduces adaptation and puts society at risk.